Peter took a shine to music at an early age. When he was five years old (around the time he wrote his first symphony for pulled cats' tails), his parents finally relented and got him a violin. 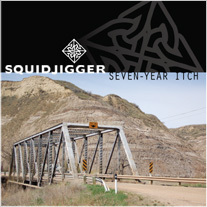 Although the "music" he played sounded strikingly similar to the complaining cats at first, he eventually gained enough skill to become a contributing member of Squidjigger on the viol-- er, fiddle. Peter always wanted to be in a touring band, so when the boys refused to take the show on the road, he decided to put some road between himself and the show by moving to Calgary. Many years and hundreds of thousands of travelled kilometres later the mystique has long worn off, leaving him to question the wisdom of that decision. When not playing music with the boys, Peter can be found elbow-deep in airline business, coding websites, globetrotting or embarrassing himself at racquet sports. You can get a hold of Peter here.